Guinness World Record-breaking, Fringe First-winning, Perrier finalist, Backstage Pass news-based song and sketch show NewsRevue is back. 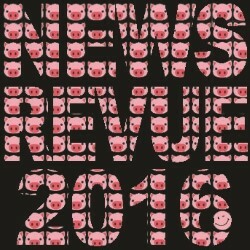 Although NewsRevue is a Fringe stalwart its content changes all the time, reflecting the very latest world events; the Edinburgh show is a highlight of this year’s news so expect the very best of British satire. From Trump’s Tweets to the EU Tango, politicians and celebrities alike come under fire in a turbo-charged barrage of bladder-threateningly funny songs and sketches brimming with punchlines. The longest-running live comedy show in the world is flawlessly delivered by four outstanding performers - Jessica Brady, Daniel Collard, Naomi McDonald and Matthew Pennington - at lightning speed. They are expertly accompanied by an on-stage Musical Director, Tom Barnes, who steers this ship of laughs with a skilled piano accompaniment. NewsRevue’s exceptional writing, superlative performances and original takes on current affairs have made it a Fringe must-see. 18th August is NewsRevue’s official 37th birthday in Edinburgh – the city where it all began. Producer Emma Taylor comments,"I have been producing the show in London and Edinburgh since 2001. I fell in love with NewsRevue 16 years ago and now it's part of my life. Throughout the year I keep a close eye on who has the potential to be shortlisted to audition for Edinburgh which is a highlight for many aspiring comedy performers. I also monitor our stand-out material keeping note of what will hopefully stand the test of time in preparation for the Edinburgh show." The show is acknowledged as a highly successful springboard for all the incredible talents involved, many of whom started their careers on the show before scaling great comedy heights. Described by Chortle as ‘a rite of passage for all comedy new-comers’ previous alumni include: Rory Bremner, Reece Shearsmith, Alistair McGowan, Bill Bailey, Sean McCann, Michelle Collins, Zoe Lyons, Nick Helm, Cariad Lloyd, Bridget Christie, Gemma Arrowsmith, Sarah-Louise Young, Lorna Watson, Gemma Whelan, Luke Toulson and Sara Pascoe.